Intrepid British International School students Cassandra Sherlock, Anjalee Syangbo, Kieran Teo, Raymond Windsor, Siamy Yapp and their teacher Ms Jo Newton, recently returned from a two-week adventure on Buton Island in Indonesia. The trip was a chance for them to see first hand the work of Operation Wallacea, an organisation dedicated to biological and conservation management research programmes all over the world. The BISP students wrote this travelogue about their experience. 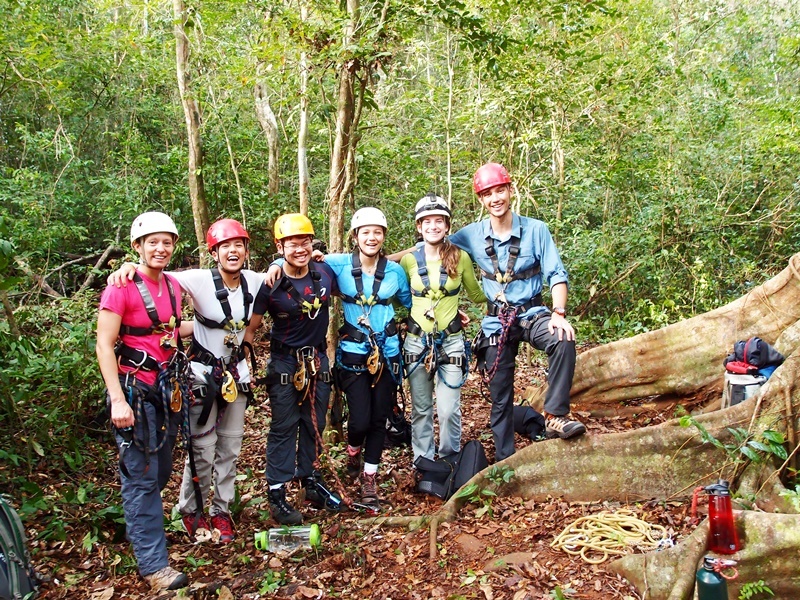 The six adventurers from BISP get ready to climb into the rainforest canopy. 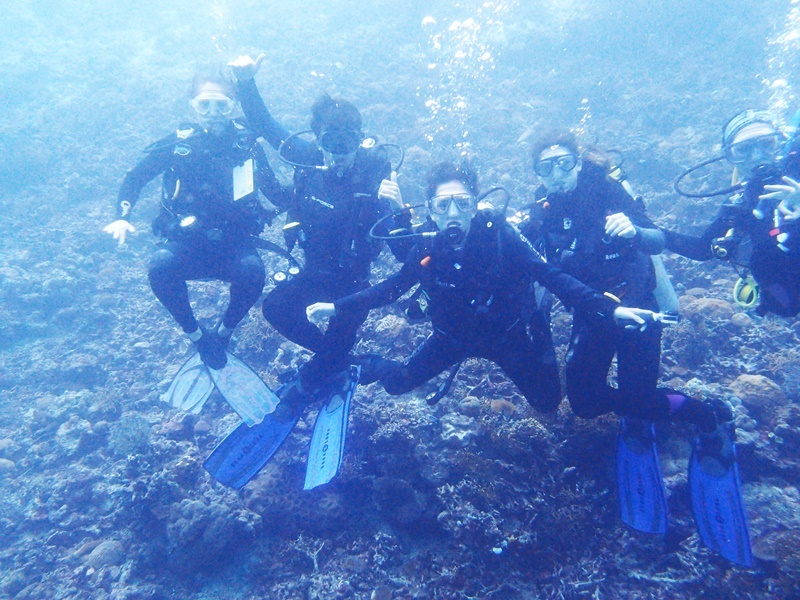 Scuba diving among the tropical sea-life was one of the highlights of the trip. The smallest plane I’ve ever been on landed gently at Bau Bau airport on Buton Island, where airport security consisted of a man pushing a trolley of rucksacks from the plane to the small outbuilding and checking our luggage tags as we caught out first sight of the beautiful, hot island. We walked out to a line of cars that looked ready to take us to the starting line of the Amazing Race! Two hours later we arrived at the village, where we stayed the night in local-style houses and ate traditional Indonesian food at their community centre. The first activity of the expedition was “canopy access”, and this was definitely a favourite. It consisted of climbing a strangler fig tree that was about 148 feet high, which allowed us to see where 40 per cent of all life exists – the rainforest canopy. Next was our trek to our jungle camp-site. Thanks to a good night’s sleep in the local homes of the Indonesians, we managed to pull through an incredibly tiring trek to Bala. In Bala, we did a jungle survival training, which consisted of building a water-resistant shelter, creating booby traps to catch animals and cooking eggs in palm leaves on a fire that we started ourselves. Our daily tasks also included surveying organisms such as reptiles, bats, butterflies and mammals. Each day was filled with tackling nature and in the process we developed a new type of sport – “mud skiing”. This was when it had rained so heavily the day or night before, and all of the trails were filled with mud so in order to walk down, we needed to slide down each slope. At the end of our active day, we would finish with an interesting lecture about tomorrow’s survey. One of the highlights of the Bala camp was the sleeping situation: Each of us fell asleep to the swaying of our hammocks within a covered tent. After marching from Bala, we arrived at our new our base camp and after spending the night, we continued on to the marine site in Bau Bau. It seemed a blessing after a week in the jungle, with functioning toilets, showers and air-conditioning. But, I speak for us all when I say that Bala certainly had more character and exclusivity than any ordinary motel. There, we met a great many researchers and budding marine biologists. It was a thoroughly fascinating experience, for some in our number learned to dive, whilst others honed their marine surveying skills. I struggle to recall a week that seemingly passed in a heartbeat, but the final night was unforgettable. We set up a gargantuan camp-fire, while local and international music played in the background, all this amidst party games and incessant chatter. Many of us, who are unlikely to ever meet again, bonded in this moment, and it was heartbreaking to leave the next day. Our six sombre faces told the story as packed into a car on our final day, we were all very sorry to be leaving Indonesia behind and going back to face reality. Aptly sad music played in the background on our flight as our furrowed frowns and heavy hearts were carried away by a propeller plane, off into the sunset and away from paradise.